There are three functions introduced in this category for the casting and conversion of values. This function is used to convert a string value to the requested/specified data type; you can optionally include the culture in which the string has been formatted. This function should be used to convert a string to a number or date/time data type. For other types of conversion you should continue using CAST or CONVERT. The performance of this function is slightly impaired because it relies on .NET CLR. In previous versions of SQL Server we used the CONVERT function to convert a value to another data type, it works fine as long as the passed value can be converted to requested data type but if the value cannot be converted an exception is thrown. IN SQL Server 2012 TRY_CONVERT can be used which returns a value converted to the specified data type if the conversion is successful or it returns NULL instead of throwing exception is the conversion cannot be performed. The PARSE function converts the string value to numeric or date/time data type value when the conversion is successful or else it fails with an exception being thrown. This is where TRY_PARSE can be used which returns a value converted to the specified data type if the conversion is successful or else it returns NULL. The EOMONTH function is little different from the above functions and returns the last day of the month (end of month) of the passed/specified date. 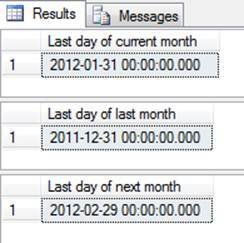 You can also pass a second optional parameter to add months and return a calcualted result.